One in an occasional series on people who do interesting or unusual jobs. MANSFIELD - For Roger Lee, life is sometimes touch and go. And he likes it that way. Lee, 54, is the chief instructor pilot for King Aviation out of Mansfield Airport, and this day is guiding a student doing touch-and-go landings. They are flying a Cessna 172SP from Mansfield to North Central Airport in Rhode Island, where the student will touch the plane down briefly, goose it to full power, take off again, and then circle back to touch and go again. "I like your throttle control," Lee says to the student, Victor Saraceno, 49, of Holliston, as the plane dips into its final approach to the Rhode Island airport. "You're doing great." The plane bounces gently on the runway, pops back into the sky and repeats the maneuver four times before returning to Mansfield, the one-hour lesson complete. Lee finds himself in one of the most dangerous occupations in the United States. The federal Bureau of Labor Statistics routinely lists the general job of pilot as one of the top three most dangerous jobs. In 2005, the most recent year for which statistics are available, pilots were third on the list, with 109 fatalities, or 92.4 per 100,000. The most dangerous job was fisherman; logging was second. The year before, pilots ranked second, with 66.9 deaths per 100,000. But Lee can take comfort in the fact that flight teachers are statistically better off than pilots as a whole, since the larger category includes such risky jobs as stunt pilots and crop-dusting pilots. Instructional flying resulted in 13.2 percent of all flight accidents in 2005, but only 6.5 percent of fatal crashes, according to the Aircraft Owners and Pilots Association's Air Safety Foundation annual report. Does Lee ever get sweaty-palm nervous as a novice takes the controls? No, he says. Ever think about a safer profession? No again. He loves what he does, he says, and never considered anything else. Mansfield Airport was the site of a fatal crash Sept. 9 - the first in the history of the airport, which has been in existence since the 1930s. A small plane with four friends aboard stalled and crashed after takeoff. The accident, which killed the pilot and one passenger, is being investigated by the National Transportation Safety Board. The pilot was not an instructor but held a private pilot's certificate. In teaching people how to fly, it's safety first, and second, and always, Lee said - a sentiment echoed by David Dineen, owner of King Aviation. "It's all about safety," Dineen says. "We have a 20-point checklist for our fuel supply here alone to make sure it hasn't been contaminated." Much of the training is how to deal with emergencies, such as when a plane stalls, Lee says. "You have to have a cool head." Lee did just that when, in 2000, the plane he was checking out for a prospective buyer stalled mid-flight. Lee was able to safely land the plane in a field in Bridgewater. "It's not just having a plan B," he says, "but C, D, E, F."
One of the main reasons for small aircraft crashes is running out of fuel, which Lee says he finds incredible. "I don't launch anyone out of here without a full tank," he said. On this particular day, Lee is teaching Saraceno, owner of a small phone systems company, the safety approach that will ideally spare him serious emergencies. They speak easily, Lee's instruction full of the aviation jargon familiar to those in the field. "We'll go full back elevator, then fly level over the field to gain speed," Lee says as the plane lifts off a grassy runway at Mansfield. Once there, he lets Saraceno practice landing with the flaps at a variety of angles, saying at one point, "No more than 20 flaps; we'll squeeze in a little more throttle when we turn for final." Up and down the Cessna goes, using no flaps for two of the touch-and-go landings, until it's time to head back to Mansfield. Lee peers into the distance and advises Saraceno to use visual sightings of landmarks to guide the way back. "See that?" Lee asks. "Blue Hills in the distance, Gillette Stadium over there, and there's Route 495. We're practically home." King Aviation teaches about 80 students, Dineen said, using 10 aircraft at the air field strictly for that purpose. 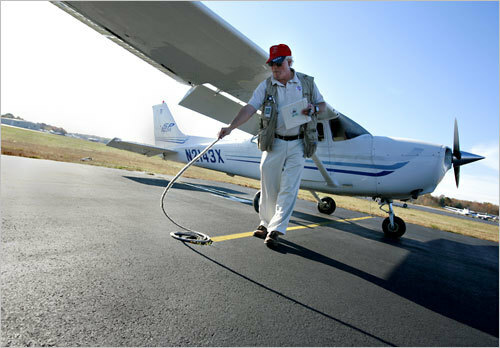 The school is an official Cessna Pilot Center, and provides roughly 50 to 60 hours per student seeking a pilot's certificate (they're not called licenses). Lessons are stretched out to meet each student's time and financial needs. The total cost of all the lessons necessary to qualify for a certificate is roughly $9,000, Dineen says. While lessons can be extended over the course of a year or more, Lee recommends taking lessons once a week. "Flying is a psychomotor skill," he says. "You need to keep doing it. You wouldn't learn skiing by taking one lesson a year, for example." Part of the safety training includes a rigorous preflight check by the student pilot, who makes sure the flaps are working smoothly, and who looks for things like cracks in the skin of the aircraft. "We teach the same stuff to everyone, but it's catered to the individual because everyone learns differently," says Lee, who was in the food service industry for 18 years before learning to fly and eventually becoming an instructor. Each training plane is taken out of service every 100 hours, tuned up, and inspected thoroughly, using mirrors to see into hard-to-reach places to check for decay. If any rust is found, the plane is grounded until fixed. Though each lesson is one hour, Lee teaches in two-hour blocks so as not to have students feel rushed. "If you're rushed, you'll take shortcuts," he says. "We don't want shortcuts."